Check out below to find out who’s fighting, how the preliminary bouts shape up and what fight fans can expect from a freebie event on ESPN, which is scheduled to start at 9:00 p.m. ET. There’s not much to dislike about a free Manny Pacquiao fight. After all, Pacquiao has only competed on pay-per-view (PPV) cards since 2005. That’s a very long time, especially for one of the most popular figures in boxing today. Luckily for fight fans, the Filipino champion will be featured on ESPN later this evening as he aims to win his third-straight title fight. The 38-year-old southpaw may not have a ton of ring time left, so it’s important that we capture these moments when they’re made available. Pacquiao is easily one of the best pound-for-pound boxers of the past 20 years and can still hold it down despite being past his prime. Pacquiao will travel to Australia for the very first time in his storied career and compete in his first title defense since losing to Floyd Mayweather Jr. back in 2015. The son of legendary boxer “Sugar” Shane Mosley will make his first trip outside of the U.S. when he takes on undefeated Australian middleweight prospect David Toussaint. Mosley Jr., 26, is obviously not as good as his father once was, but he has already compiled a professional record of 10-1, capturing seven of those wins by way of knockout. That said, Mosley Jr. is only a -147 favorite, so boxing oddsmakers are already suggesting his tilt with Toussaint will be the most competitive bout of the evening. With boxing royalty at stake, this is not one you want to miss. MMA fans should know this name by name. Not only is Michael Conlan one of Conor McGregor’s main boxing squeezes, but the former Olympic medalist has decisively won his first two professional bouts by way of third-round knockout. The 25-year-old is scheduled to fight super bantamweight Jarrett Owen in the opening main card bout, which gets underway at 10 p.m. ET. Conlan is a heavy favorite to get past Owen, who has produced a dismal 5-4-3 record throughout his professional boxing career, so it may be another quick knockout finish for the rising Irish sensation. Stay tuned! With noticeable names like Pacquiao, Conlan, and Mosley gracing this free ESPN card, the growing interest level will be difficult to bottle. Pacquiao hasn’t fought outside of a PPV card in over 10 years, Conlan is looking to finish his first three professional bouts by way of knockout, and Mosley Jr. is trying to create his own name in the shadow of his father. Add in a super flyweight title fight between champion Jerwin Ancajas and Japanese challenger Teiru Kinoshita, and you have one of the best free combat cards of the year, whether it be boxing, kickboxing, or MMA. Considering not much else is on the docket for later tonight, fans will flock to the television set to see “Pac-Man” play spoiler in Brisbane. 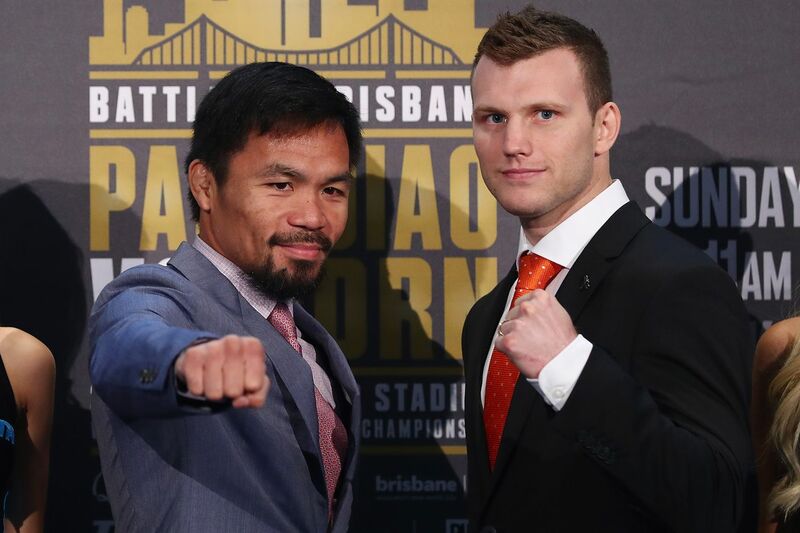 Stick with Mania for complete ‘Pacquiao vs. Horn’ results and coverage.